Ah, summer… time for backyard barbecues, poolside parties, sunny vacations, and more! As you get your family ready for summer adventures, don't forget to schedule a teeth whitening to get your summer smile ready for all of the photos you're about to take during your travels and activities! While in-office whitening isn't permanent, it does offer longer-lasting, better results than over-the-counter whitening options. However, you can help keep those pearly whites whiter for a longer period of time by following a few simple post-whitening tips from Dr. James Courey and Dr. Joseph Zagami. 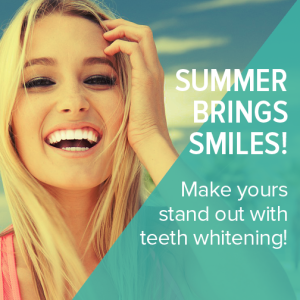 Our entire Manalapan dental team LOVES summer activities and we know our patients do too! Book your whitening appointment today at 732-577-0555 and be ready for all that summer has to offer. Want to win FREE professional whitening? Tag our practice on Instagram @specializeddds on your summer photos and be entered to win free ZOOM! professional whitening (a $850 value)! We can"t wait to see all of your adventures!